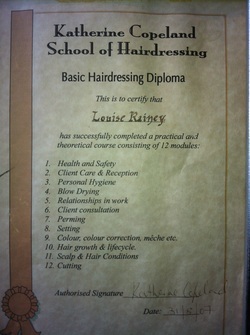 Katherine Copeland Hairdressing Training School. Hairdressing training school that has been running for 7 years, with all fields covered, ranging from blow-drying to all aspects of colouring including colour correction and basic cutting to advanced cutting (up to date cutting included). Course runs from september until end of june, one day a week in salon. The perfect chance to change your career or just to learn a trade.